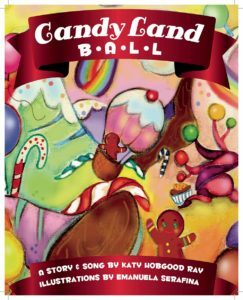 Candy Land Ball, a story and song by Katy Hobgood Ray. Illustrated by Emanuela Serafina. The Candy Land Ball is a story book & song book by Katy Hobgood Ray. This is the follow-up to the recorded song from the Parents’ Choice® Award-winning children’s music album, We’re Going to Confetti Park! The printed story book version of the Candy Land Ball includes colorful illustrations and a piano score with lyrics, and a link to listen to the song performed by Katy & the Confetti Park Players. Sure to delight young readers and budding musicians! Order now on Confetti Park or Amazon. The song “Candy Land Ball,” which is on our first CD, was inspired by an annual event in New Orleans. The Candy Land Ball is a magical children’s ball that raises funds for parks and children’s programming in Algiers Point for 501(c)3 Confetti Kids, Inc.